Yesterday, Emmanuel Mwamba summoned exiled artiste Fumba Chama (Pilato) and Amnesty International for a discussion regarding Pilato’s decision to flee the country amid threats on his life. But in doing this and in order to please his paymaster, Mwamba dismissed the death threats on the influential artiste. 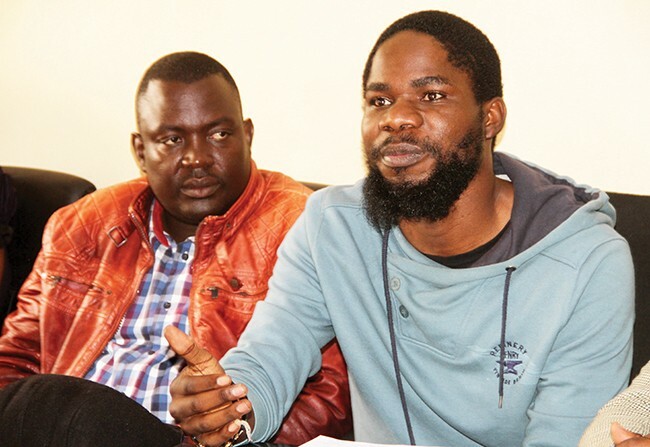 He said Pilato is simply denting the image of Zambia, which to him is paradise. But Pilato is not amused and has described Mwamba nicely. By nature humans don’t listen to what is said but to who is saying it. That is why it is very important for every leader to posses a certain level of integrity because it doesn’t matter what you say, it matters who is saying it. Ambassador Emmanuel Mwamba lacks this level of integrity. All he needs is a good pay and he will say anything. He speaks out of duty not out of conviction. He has no reputation for caring or speaking for victims. He is simply a make-up artist for criminal acts even against his own brothers and sisters. He survives by justifying corruption and the corrupt. This is a brilliant young man who has offered himself to serve as a mop for cruelty and crimes against humanity. His job is to lie to the president that the international community is under his armpit, but what is worrying is the fact that he is squandering his own future just to stay relevant today. I fail to understand why he is so much in a hurry to discredit himself and the office that he holds. Maybe this is something we should pray for as a country. Against this background, i find it hard to sit in a meeting with a man whose job is to dress-up crimes committed by his boss. I would rather sit down with his boss instead of wasting my time in a meeting with a man who can’t speak his mind. I dont speak to shadows. I have no time for men who disrespect themselves like that. I would rather sit and talk to myself than talk to someone who has abandoned his own mind just to get a salary. In his attempt to sound smart, he is belittling the death threats against my life. As i read his statement, I asked myself, who has paid him to embarrass himself this loudly? Does he want to see me killed so that his government can claim not know who did it? Do I have to die for him to know the threats were real? The levels of desperation exhibited by ambassador Mwamba are so worrying but thats what you expect from leaders who are guided by greed and selfishness. They can do or say anything as long as they are gaining something. These are men who have cremated their own consciousness just to have a job. My advise to the most excited and undeplomatic deplomat is, yama bukeni. You are young and intelligent, be an instrument of benefit to the people not only to those who have conspired to rob our country. You are sacrificing too much for too little. Wake up my brother and see that there’s something more to life than just money and power. Quit being a devil’s pawn and let the light of God shine in your life.